The anti-Muslim organization ACT! for America has fired the head of its San Antonio chapter apparently for — get this — being too extreme. 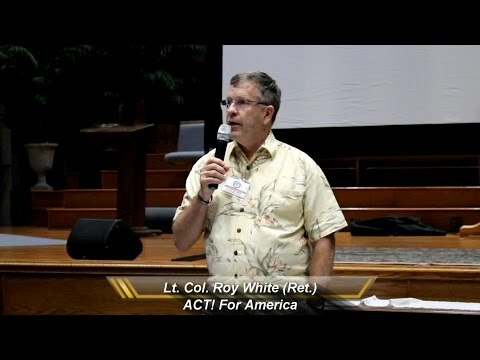 And the guy who got canned, retired Air Force Lt. Col. Roy White, is very familiar to us as TFN. According to the San Antonio Express-News, ACT! for America fired White after White posted a note online that advertised a chapter meeting last week as an opportunity to learn how to “shut mosques down.” The San Antonio chapter also lost its affiliation to the national organization. The “shut mosques down” bit seems to have gone too far for ACT! for America. That seems odd. After all, the group and its leader, anti-Muslim hysteric Brigitte Gabriel, insists that Islam is a threat to America and that radical Muslim infiltrated the U.S. government during the Obama administration. Read more about Gabriel and ACT! for America from the Southern Poverty Law Center here. In any case, that San Antonio meeting last Thursday featured a talk by Karen Lugo, author of “Mosques of America: A Guide to Accountable Permit Hearings and Continuing Citizen Oversight.” Lugo also is director for the Center for Tenth Amendment Action at the Texas Public Policy Foundation, a far-right organization founded by wealthy San Antonio businessman James Leininger. Leininger is a longtime supporter of far-right causes in Texas (as noted in a 2006 TFN Education Fund report here). You can read here some of what White told the State Board of Education about those textbooks at a public hearing in November 2014. Scroll down to the 2:50 time stamp. It’s doubtful we’ve heard the last of White. His obsession with Islam isn’t likely to go away even if he’s no longer working with ACT! for America.